2-Year Warranty, Weatherproof, Cloud Service, Free App! Requires Android 4.0 and up or iOS 7.0 and up smartphones with the free Zmodo app. You will receive motion notification through the Zmodo app when unexpected motion is detected. Connectivity: 2.4 GHz Wi-Fi network only. Local Viewing: No Network needed, just connect the system to a monitor via HDMI/VGA port and enjoy multiple-cam views on one screen. You can also view the live view from computer. 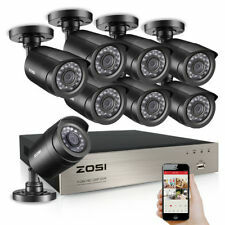 ZOSI 720p 8 Channel 4-in-1 Security DVR. Clearance Price & Extar $10 off, 4/25 Only! Free Ship! 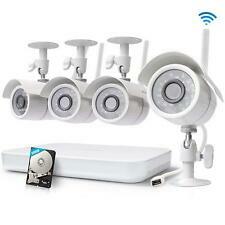 1080P Wireless WIFI CCTV Camera NVR System with 1TB HDD pre-installed. Supporting email alert, motion detection, free phone APP, remote and playback, USB Backup. High Resolution and good IR Night vision. Noted: The wireless system need power cable to power the camera and DVR. Support WiFi or 2G/3G/4G Network to view video. We have one year WARRANTY !. Wireless infrared motion detector and door or window gap detectors is a wireless outdoor and indoor security device designed to sense motion activity, monitor whether a door, window, or other object is open or closed, then transmit alert signals. It only compatible with 2.4GHz WIFI, not work with 5 GHz WIFI. It doesn't support NVR. CCTV Accessories. Wireless Network:WIFI(IEEE802.b/g/n),Outer wirelss antenna. Ethernet:10/100Mpbs,RJ-45 Interface. Security System. Video Recorder. Video Cable. Video System:PAL/NTSC. Video Compression Technique:H.264. To connect with cell phones or Tablet PC Both Android and Iphones work fine! We are located in NJ. (HD 1080p Video. 1) Wall Mount Screw Set. Trending at $134.50eBay determines this price through a machine learned model of the product's sale prices within the last 90 days. Easy installation,plug and play -- Wireless video security system is easy to setup and diy installation without any video cables. Connect the mouse to NVR. Connect PC/TV monitor to NVR with a VGA/HDMI cable. Wi-Fi security camera systems can be an excellent way to always know the goings on in your house without having to sign up for a long-term service contract. Some of the systems are easy to install, and some you can install yourself without the help of a handyman or electrician. 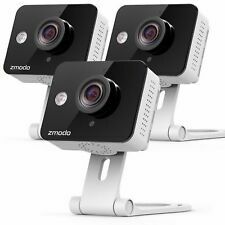 There are many different options available when it comes to Wi-Fi security camera systems, and you can find a wide selection of them available on eBay. What should you know about installing these cameras? The Wi-Fi security cameras come with mounting equipment to help you place them anywhere you choose. It's important to take the time to check the angle of the camera before installing it to make sure the position is correct. You don't want to have to take the camera down and remount it multiple times. 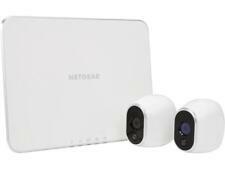 How does a Wi-Fi security camera system work? With a Wi-Fi security camera system, sensors installed throughout the home and a frequency generated from the sensors help you control the security system through a device. The control device sends the footage taken by the cameras to an online storage file or to a network video recorder that stores the footage offline. The device then connects to the internet via Wi-Fi, so that you can view the footage in real time through your phone, tablet, or computer while also storing it at the same time. Do you need to invest in a hard drive? There is no need to invest in a hard drive when you purchase a Wi-Fi security camera on eBay. Many of them have built-in storage that can hold many terabytes worth of footage. A number of them can also stream footage to your phone and even save the footage in an online database in case you want to view the footage remotely. How are the cameras powered? Wired security cameras: There are security cameras hardwired to your home. That means that wires are run through your walls to the mounted cameras to provide them with the power they need to operate day and night. Battery operated cameras: Some of the security cameras use batteries for power. It's crucial to pay attention to these cameras to ensure that you change the batteries often so that they don't die and stop recording. Solar powered cameras: Solar panels commonly power outdoor security cameras. There are often solar panels either built onto the top of the cameras or on a panel that connects to the camera to provide it with the power that it needs. Celebrate Memorial Day this year with everything you need for a BBQ and shop for smart security cameras and more deals to make the event complete.